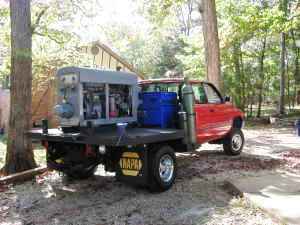 Ever thought about having your own portable welding rig? Most of us at some point in time have seen a slick portable welding truck going down the road and thought to ourselves..." Man , I would like to have a slick rig like that". I found this video of welding trucks entered in a "slick rig" contest held by Pipeliners local 798 out of Tulsa OK.
Tulsa is the Mecca of pipeliner welders. After all, local 798 hands welded the Alaska Pipeline. If you are looking for ideas on how to design your portable welding rig, this short video will give you some ideas. Its kind of fun to watch . Some of these guys with their own rigs are knocking down some Jack. I have heard reports of guys with their own portable rig making way into the six figures...It's hard work. But it's good and honest hard work. A reader recently sent me some pics and description of his welding trucks unique design. My Pride and Joy Welding Rig getting redone. Was a Verizon fleet truck before I bought it and outfitted it. MY WELDING RIG AFTER I OUTFITTED IT. WAS A VERIZON FLEET TRUCK.